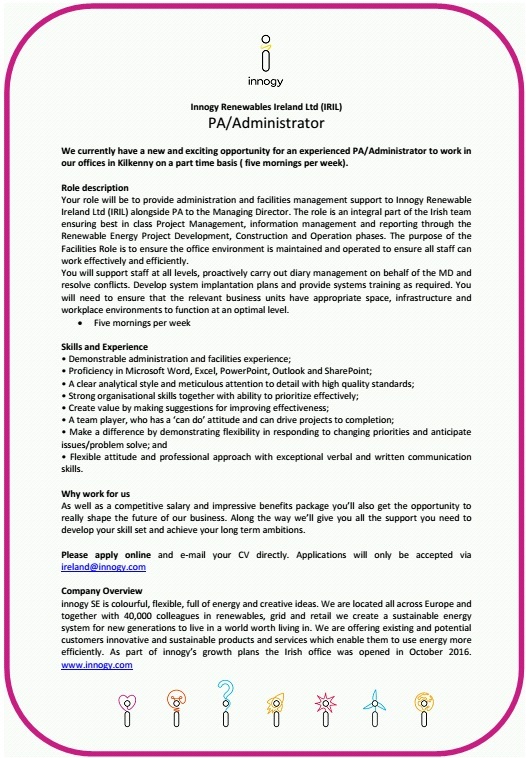 Innogy Renewables Ireland Ltd (IRIL) currently have a new and exciting opportunity for an experienced PA/Administrator to work in their offices in Kilkenny on a part time basis ( five mornings per week). The ideal candidate will support staff at all levels, proactively carry out diary management on behalf of the MD and resolve conflicts. Develop system implantation plans and provide systems training as required. You will need to ensure that the relevant business units have appropriate space, infrastructure and workplace environments to function at an optimal level. develop your skill set and achieve your long term ambitions. efficiently. As part of innogy’s growth plans the Irish office was opened in October 2016.